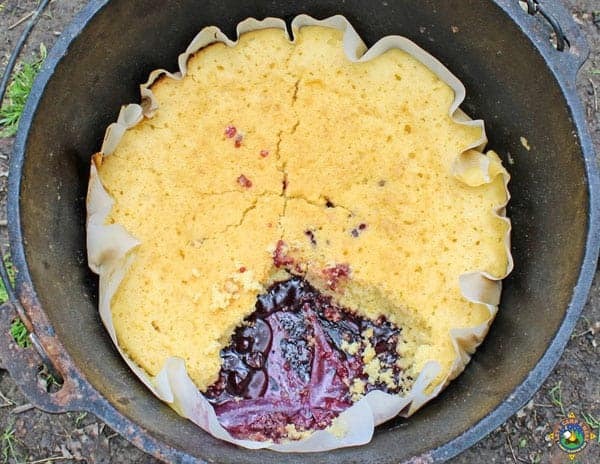 Enjoy this Lemon Blueberry Dump Cake made in the dutch oven while camping. 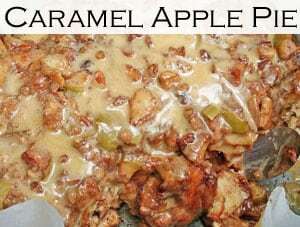 Get the recipe at the bottom of the post! A few weeks ago we went to a camping rally that had a potluck. 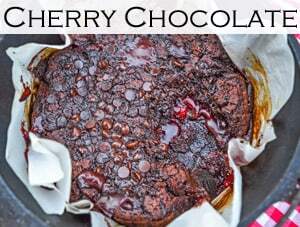 I wanted to make a new dessert in the dutch oven to share with everyone. I love the combination of lemon and blueberry, so I decided to make a dump cake. This Lemon Blueberry Dump Cake is so simple to make! 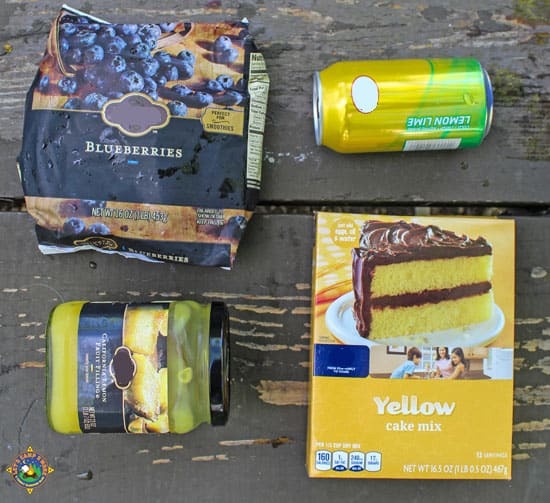 This cake recipe calls for four simple ingredients: frozen blueberries, lemon curd, a yellow cake mix, and a can of lemon-lime soda. I just put the blueberries in the bottom of our cooler. They defrosted a little bit, but that is fine. You can use fresh blueberries if you wish, but it will likely shorten the time of baking. It would also be easy to change from blueberries to a different variety of berry. Prepare the charcoal for the dutch oven. Line your dutch oven with a liner. 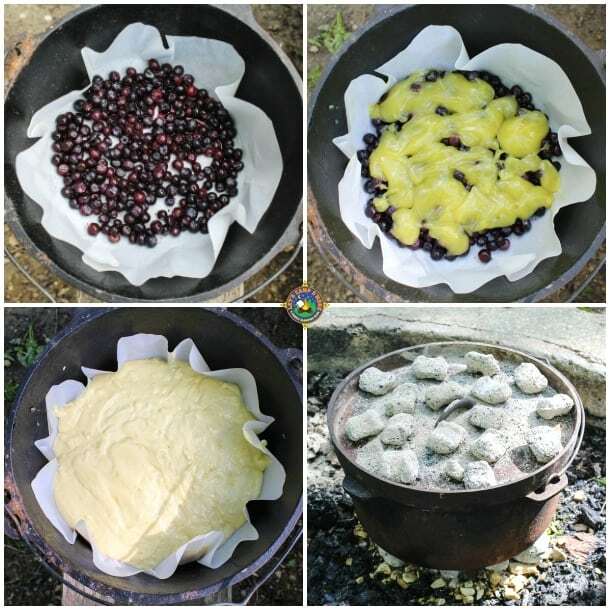 See how easy it is to make your own dutch oven liners. Dump the blueberries (including any juice that comes out of the package) into the bottom of the lined pot. Layer the lemon curd on top. Mix the cake mix and soda in a separate bowl. Pour the cake batter over the lemon curd. Place the lid on the dutch oven. Create a circle of coals and place the pot on top. Place coals on the lid. We used about 16 coals on the bottom and 16 coals on the lid. Bake for 1 hour or until a knife poked in the middle comes out clean. The cake turned out really well. Many people at the potluck complimented on how good it was. I love baking cakes with soda and a cake mix in the dutch oven. The cake part turns out so high and fluffy. 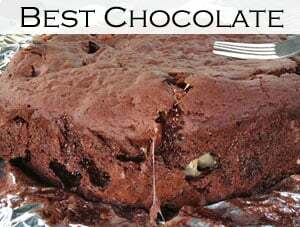 Make sure you check out our Dutch Oven Chocolate Cake. Do you like lemon and blueberry, or would you prefer to use a different kind of berry? 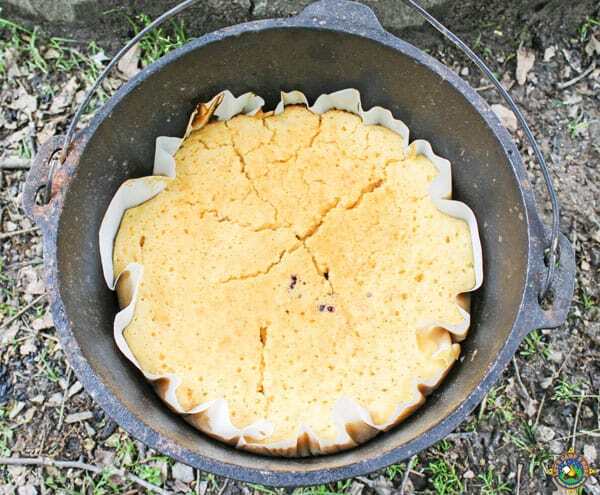 Line your dutch oven with a liner. Dump the entire package of blueberries into the bottom of the lined pot. Layer the lemon curd on top of the blueberries. Mix the cake mix and soda in a separate bowl. Pour the cake batter over the lemon curd. Create a circle of coals and place the pot on top. Thanks for stopping by, Leo! 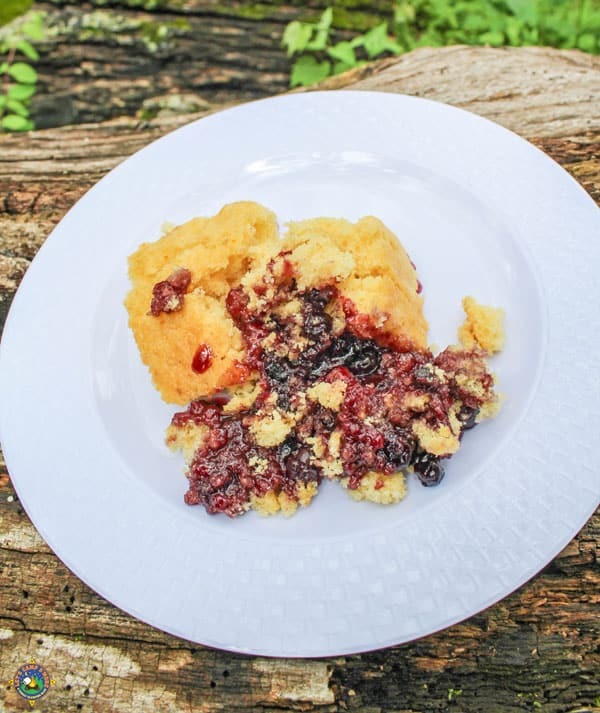 What a great Dump Cake recipe for the camp out! Thanks so much for sharing your post with us at Full Plate Thursday. Have a great week and come back soon!